Full-time firefighter and part-time snow removal contractor, Connor Hedge, 24, of Westfield, Mass., is the proud owner of a new Power-V XT Snowplow, one of two Grand Prizes in the Heavy Metal Sweepstakes sponsored by THE BOSS Snowplow and Gravely® in September. 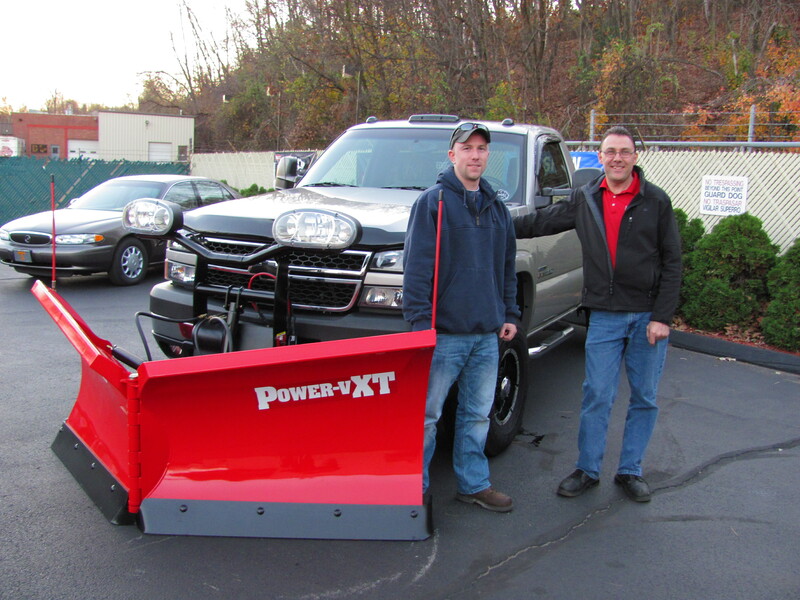 The snowplow was recently installed by THE BOSS distributor Ken’s Auto Sales, 921 Main St., Holyoke, Mass. Hedge recently picked up his BOSS plow from Ken’s Auto Sales and owner Kenneth Cashman, who operates the decades-old dealership with his two sons, Mike and Tim. Ken’s Auto Sales carries the full lineup of BOSS Snowplow products and specializes in quality installations with on-site, BOSS factory trained technicians. Hedge was one of more than 8,000 participants in the raffle-style Heavy Metal Sweepstakes, which invited current and new BOSS and Gravely Facebook fans to play online and receive daily tokens to bid on popular gear and valuable prizes, including a Gravely Pro-Turn mower, the second Grand Prize in the sweepstakes. Players who “Liked” the page received a new token each day and earned bonus entries for inviting a Facebook friend to play. Prize winners in the sweepstakes were determined through a random drawing at the end of the promotional period. During the sweepstakes period, the game generated nearly 232,500 bids and more than 4,500 new “Likes” for THE BOSS Snowplow Facebook page, helping BOSS surpass its goal of reaching 10,000 fans. Open to legal residents of the 50 United States (except Hawaii and D.C.) and residents of Canada (excluding Quebec) 18 years of age or older, the Heavy Metal Sweepstakes kicked off Sept. 1 and concluded Sept. 30.